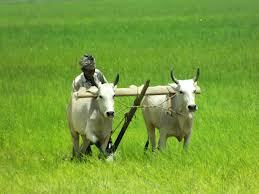 Business Case Study # 1: What should the Indian Farmer do? Was on a road-trip when I came across a possible biz dilema that is faced by most mid-sized Indian farmers. – If he decides to buy land- he will have to stretch himself really hard for 2-3 years before he can afford a tractor. What do u think the Indian Farmer should do? – Or buy a tractor & start lending/leasing to these other needy guys also. He rejected my 2nd idea rightaway- saying “If i start making money by lending tractors to others- these other guys will also buy it & I would not see the ROI on my investment”. So put on your strategic mgmt caps & tell Hari what he should be doing.